WITH SUNRISE ATLANTA MOVERS, THERE ARE SEVERAL WAYS TO BEGIN YOUR MOVE. Request a quote above: it’s quick and easy. Or give us a call to talk to an Atlanta moving specialist. Sunrise Moving and Storage, your affordable Atlanta movers, keep our moving rates as low as possible, while still providing superior moving services to our customers and clients. Sunrise Moving and Storage can provide you a clean and secure storage solution for your business or home before, during, or after your move. Call us today at 770-381-6191 or complete our easy Get a Quote form to get a no hassle quote for your next local, long distance or commercial move. Quality service, that’s our goal! As a family owned and operated Atlanta moving company, Sunrise Moving & Storage has been serving customers in the greater metropolitan and southeast areas since 1999. At Sunrise, we focus on making your move as pleasant and successful as possible through the utilization of great customer service both in our office and among the crews out in the field. With great attention placed on all details of each move, the customer’s needs are our top priority. 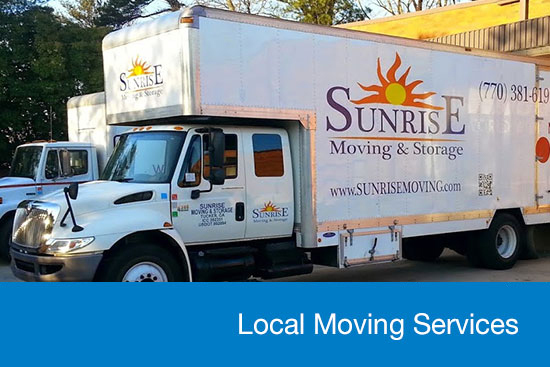 Over the years, Sunrise has built its reputation by providing high quality moving services at affordable, competitive rates. Many of our clients are repeat customers or referrals from past, satisfied customers. When you’re planning to move your family or your business, let our professional Atlanta movers plan the most cost effective and stress free move for you. 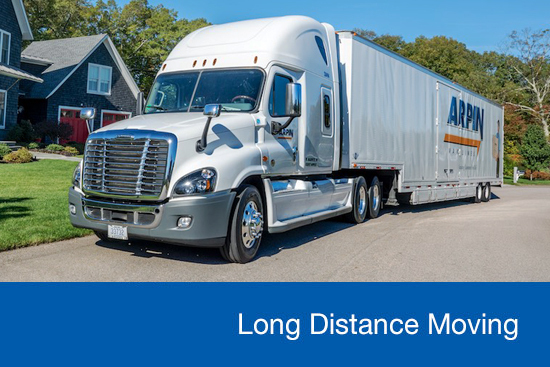 There are Atlanta moving companies out there that will try sending a smaller crew for a lower rate, leading you to believe that the cost of the move will be less. In most instances this will cause the move to take longer, therefore costing more in the long run. At Sunrise Moving, our consultants are trained in helping you plan for your needs, as well as your budget. Our professional movers will treat you and your belongings with the utmost, delicate care and attention from the pick up through delivery. We understand that moving is one of the most stressful times in a person’s life. Let us know what you need and we’ll help you through every stage of this process. Let us take the stress out of your move! We understand that moving is one of the most stressful times in a person’s life. Let us know what you need and we’ll help you through every stage of this process. Let us take the stress out of your move! When it comes to packing for your move, you have a few options to choose from. We can do a full service pack and move, where we provide the boxes and materials and take care of the packing for all of your belongings. You can purchase boxes and materials from us and pack everything yourself. You can purchase boxes and materials elsewhere and we can use them to pack your belongings for you. Or you can purchase your own boxes and materials and pack everything yourself. Whichever option you decide is best for you, we will be happy to take care of the rest! For every move, the crew at Sunrise Moving & Storage will carefully disassemble and use moving pads to wrap your large furniture pieces for transport, protecting them from being scratched or damaged. At your new home, they will then unwrap, reassemble, and place your furniture. Please visit the Storage section of our website for more information on our storage options for your move. We do not require any payment until the day of your move. The only exception is if you wait until the day of your move to cancel; you must let us know about any cancellations or reschedules at least 24 hours in advance. There are no additional fees or costs for rescheduling your move as long as we have that notice. We cannot disconnect or reconnect your appliances. Once you have unhooked them, we are more than happy to transport them for you. We would be happy to help you find a local company specializing in this for your move! 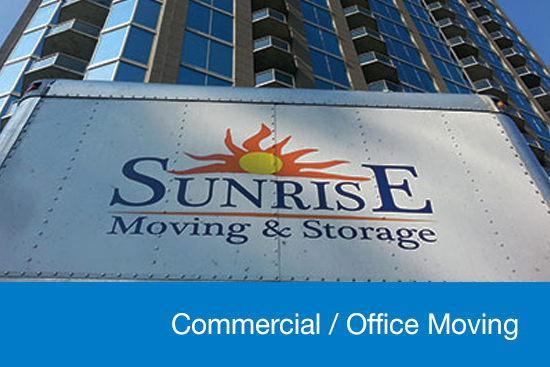 Sunrise Moving is the PRIME Arpin agent in the Atlanta, GA service area. We move families and business locally in Atlanta, throughout Georgia, across the country and around the world.